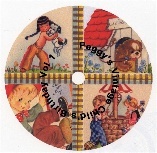 The Child's Birthday images on this CD are from many different scrapbooks. It contains number cards for ages 1 to 5, cards for family members - son, daughter, granddaughter, grandson, sister, brother, niece and nephew. You'll also find general cards to a boy, a girl and a friend, sorry I'm late and even a few from a child to mommy and daddy. This CD contains scans of 141 vintage cards with 340+ graphic images and a combined total of 408 images and sentiments. The cards on this CD date from 1938 to 1957.